The free cookie countdown is on! 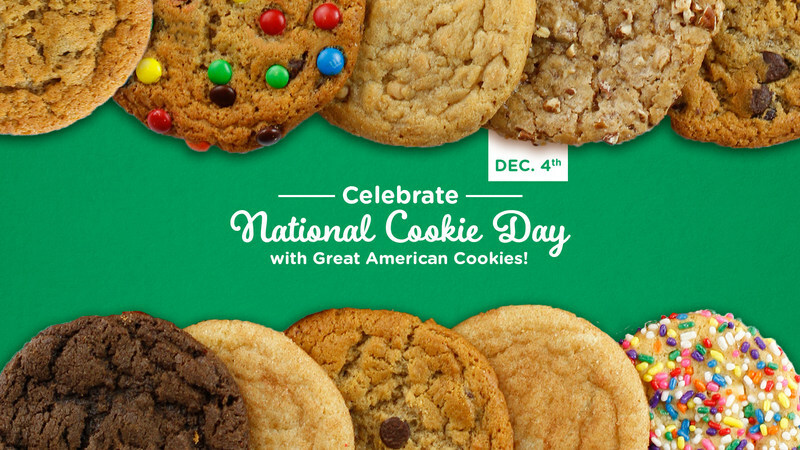 Great American Cookies®, the baker of the country’s most famous and most delicious cookies, will treat customers to one free* original chocolate chip cookie at participating stores on National Cookie Day, Monday, Dec. 4, 2017. No purchase necessary. Limit one per customer. For more information about Great American Cookies and store locations, visit www.greatamericancookies.com, follow Great American Cookies’ national Twitter handle, @Gr8AmCookies, or become a fan of the brand on Facebook at www.facebook.com/greatamericancookies. * Available on Dec. 4, 2017 only at participating Great American Cookies locations. Receive one free regular chocolate chip cookie per person. No purchase necessary.